Find Better Ideas, Faster ® with a custom jumper trend report, our PRO Dashboard and 80+ categories of premium trend reports. The Jumper Trend Report is an inside look into the latest sweater designs set to be released by the always evolving fashion industry. We look at multiple types of sweaters to provide readers with a full perspective of what's set to be trending next amongst the consumer public. Through our detailed research, we highlight numerous different jumper designs including those featuring high performance materials, unique pop culture decorations, abstract angular patterns and sleek fashion silhouettes. Those closely involved with the changing tides of the fashion industry will appreciate this in-depth analysis of upcoming jumper design trends. Designers, apparel marketers and fashion retailers will be provided with a glimpse into what they can expect next season, and will also be given insight into the purchasing preferences of customers as well. 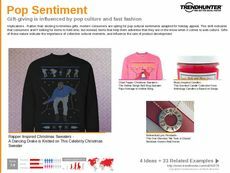 Trend Hunter's Jumper Trend Report is a predictive toolkit designed to help fashion professionals track the latest apparel-themed trends resonating with consumers.